GENEVA, Switzerland – The weekly number of new Ebola cases registered across Guinea, Liberia and Sierra Leone rose in the last week of January, marking the first hike in 2015, the World Health Organization said Wednesday, February 4. "Weekly case incidence increased in all 3 countries for the first time this year," the UN health agency said. During the 7 days leading up to February 1, 124 new cases were confirmed across the 3 west African countries at the epicenter of the devastating outbreak. Thirty-nine of the new cases were in Guinea, where the outbreak began in December 2013, with at least 11 new cases attributed to a single unsafe burial. A week earlier, the country had confirmed just 30 new cases. Liberia meanwhile recorded 5 new cases last week, up from four the week before, and Sierra Leone confirmed 80 new cases, up from 65, according to the latest statistics. "Continued community resistance, increasing geographical spread in Guinea and widespread transmission in Sierra Leone, and a rise in incidence show that the (Ebola) response still faces significant challenges," the WHO said. In total, 22,495 people have been infected with the virus across nine countries, and 8,981 of them have died, according to the latest numbers. 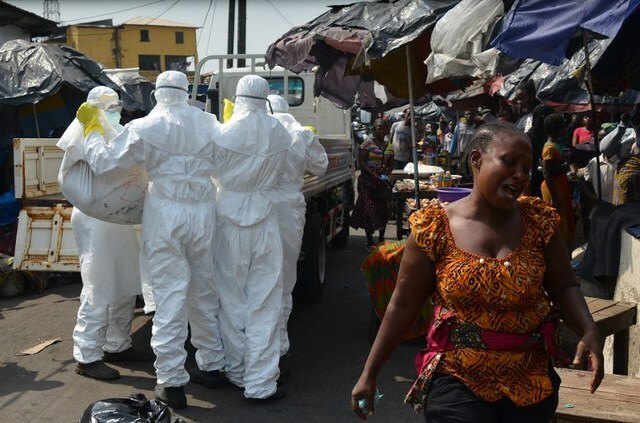 All but 15 of the deaths have occurred in Guinea, Liberia and Sierra Leone. Massive efforts and funds have been poured into trying to rid the three west African countries of the Ebola scourge, and in recent weeks a sharp drop in new cases gave rise to optimism that the worst was over. Ensuring safe burials of the highly contagious bodies of those who die from the virus has been a top priority. But Wednesday's numbers showed the message still had not gotten through, with devastating consequences in Guinea, where a single unsafe burial in early January in the eastern prefecture of Lola, near the Ivory Coast, led to at least 11 infections there, the WHO said. And with a prefecture near the Mali border recording its first cases, the WHO said Mali and Senegal were planning a meeting with Guinea to strengthen the surveillance coordination. Guinea counts a total of 2,975 cases, including 1,944 deaths, according to the latest statistics. The situation in Liberia, once the hardest-hit country and counting a towering total of 8,745 cases and 3,746 deaths, meanwhile appeared under control. But the WHO expressed deep concern over the situation in Sierra Leone, which counts the most cases, at 10,740, including 3,276 deaths. The UN agency warned of "intense transmission" in the west of the country. Freetown reported 22 new confirmed cases last week up from 20 the week before, while neighboring district Port Loko "saw a resurgence of cases, with 36 new confirmed cases compared with six the previous week," it said. The situation in Sierra Leone is far from under control, with 12 deaths last week occurring in the community and not in the safety of Ebola treatment centers and with 11 unsafe burials reported, the WHO said. The country is also falling short of the target of having 100% of new cases arising among registered contacts, "so that each and every chain of transmission can be tracked and terminated." In Liberia, 100% of new cases stemmed from already registered contacts at the end of last month, while in Guinea 54% did. But in Sierra Leone, only 21%, or 26 of 121 confirmed cases, arose among already registered contacts during the week leading to January 18, the WHO said. Ebola, one of the deadliest viruses known to man, is spread only through direct contact with the bodily fluids of an infected person showing symptoms such as fever or vomiting. People caring for the sick or handling the bodies of people infected with Ebola are especially exposed.